'Tis a little late to be announcing the November ornament theme, but that's just the way things are right now. The theme is yarn. I have a lot of it, and I just can't help myself when I find nice soft yarn in lovely colors, so my stash is destined to continue growing. But I do use it, so it doesn't just sit around looking pretty (although it does that as well). This month I made 3 small ornaments. I used Patons Classic Wool yarn left over from a few other projects and made small felt flowers using this crochet pattern from Aesthetic Nest. (If you're looking for eye candy, spend some time at Aesthetic Nest -- it's amazing.) My crochet skills lag far behind my knitting skills, but I took this pattern and some basic crochet instructions on vacation recently, and with a little help from my mom, I was able to conquer both the large and small felt flowers. These flowers are addictive -- I've made a least a dozen at this point. 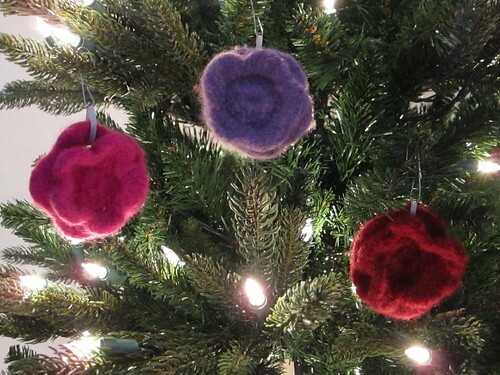 I prefer the large flower, which has 3 layers of petals and a more defined shape after it's felted, but the small flower (with 2 layers of petals) makes a great tree ornament ... or three.